It’s a six-acre organic farm smack dab in the middle of Columbia’s Hickory Ridge Village that the Shaw family has worked for almost 40 years. 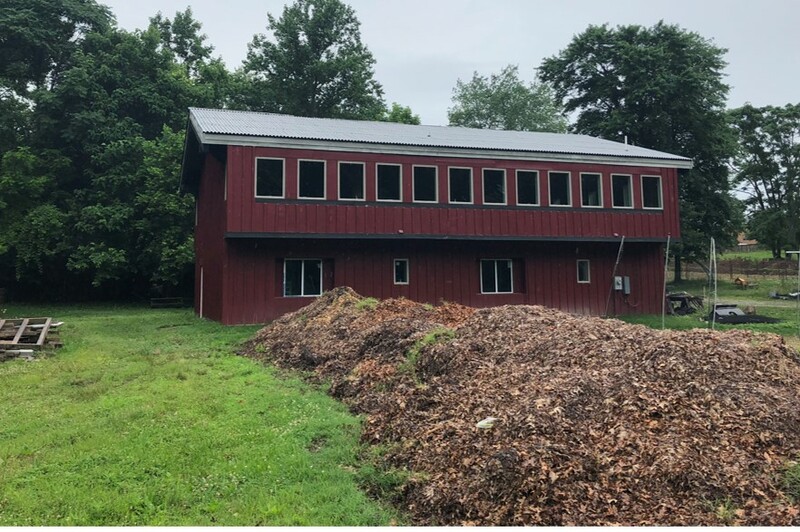 The nonprofit Community Ecology Institute (CEI) wants to save the farm from development but needs to raise $300,000 by the middle of May to make it happen. There are a multitude of reasons why we need to support them. Chief among them is CEI understands the impact that climate change may have on our community. 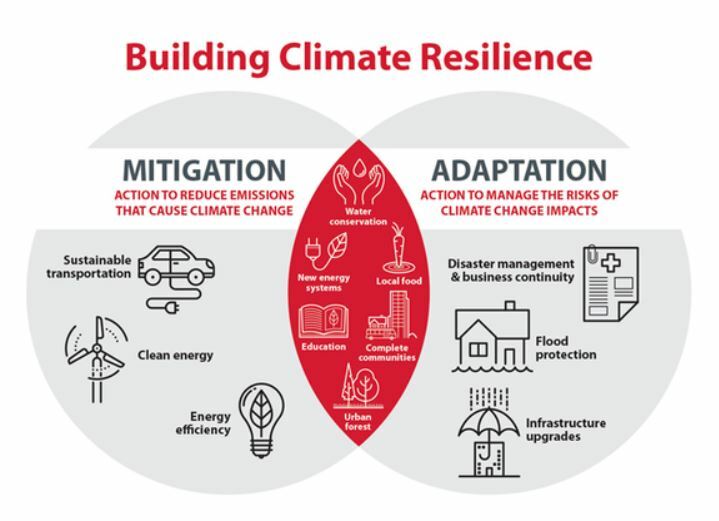 They are committed to being a model for sustainable practices and teaching the skills of Mitigation, Adaptation and Resilience. Learn about their vision and help support it if you can. It’s a worthy cause and important for the future of Columbia and Howard County, Md. Chiara D’Amore wants to transform a small organic farm in Columbia into a living classroom for the nonprofit she founded in 2016 with a mission to reconnect people to the natural world. 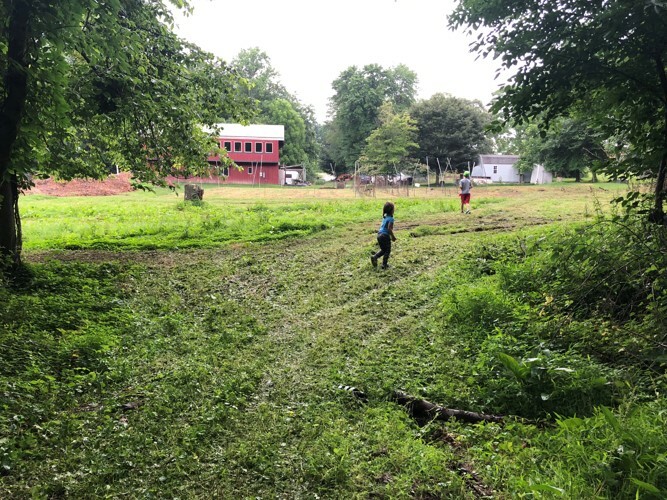 D’Amore said CEI [Community Ecology Institute] is working to raise $300,000 to purchase Shaw Farm, a 6.4-acre property in a residential neighborhood near Atholton High School. Having a facility at 8000 Harriet Tubman Lane would boost the nonprofit’s profile in the community and permit expanded programming, D’Amore said, while saving a 38-year-old family farm from development at the same time. “There is a fire in me to protect this land,” said D’Amore, who has a master’s degree in environmental science and engineering and a doctorate in sustainability education. 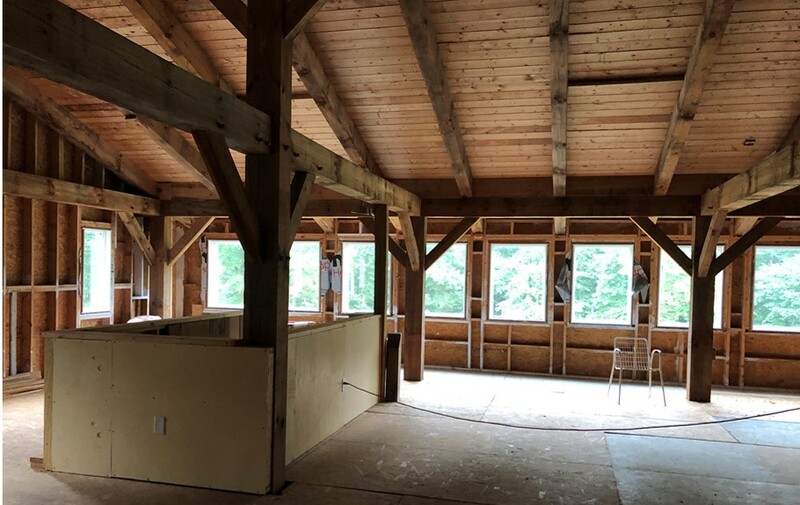 If the farm purchase moves forward, a 4,000-square-foot barn on the property that is 75 percent finished would become classroom and office space. The Shaw family sold organic produce for years at county farmers markets and donated thousands of pounds of vegetables and fruit to people in need, he said. They also sold produce in a community-supported agriculture program and later worked with food banks. “Having been involved intimately with this land for almost 38 years, it is very important to me to find new stewards for the farm,” he stated. “Working with Chiara and the other members of the Community Ecology Institute will ensure that my family’s values of clean air, water, soil and food — and putting people ahead of profits — will continue,” he wrote. The Community Ecology Institute (CEI) is a Howard County based non-profit organization with a vision for a world in which human and natural communities thrive together. Our mission is to foster socially and ecologically healthy communities by enhancing the connections between all people and the natural world. Farm preservation & agricultural knowledge — There is little agricultural land left in eastern Howard County, especially in Columbia. 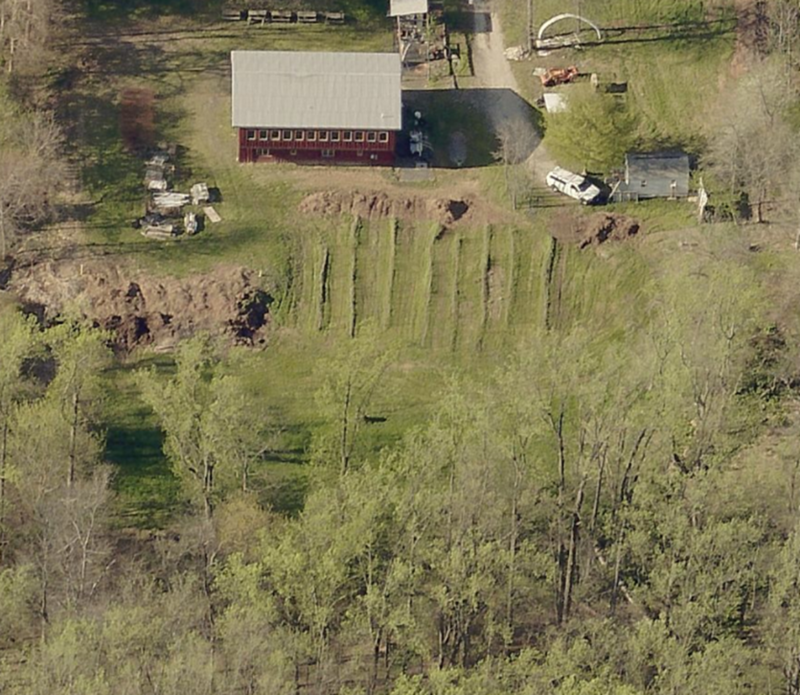 Preserving this six-acre organic farm is a worthwhile endeavor in its own right! Environmental sustainability & climate action — We will demonstrate and offer educational programming related to: conservation landscapes such as rain gardens, pollinator gardens, and food forests; . . . reducing waste through “refuse, reduce, reuse, and recycle” approaches; . . . energy and water efficiency; . . . and sequestering carbon in the soil. Experiential education programming — CEI’s mission focuses on helping people develop strong connections with the natural environment because research shows how important such experiences are for people’s well-being, the generation of knowledge that makes a difference, and the cultivation of an active environmental ethic. African American heritage programming — Local historians believe this area was an important point in the county’s Underground Railroad connections because 17 freed slaves were each given land in the community, hence the original name of Freetown. As a coastal state and home to the Chesapeake Bay, Maryland is among the states most vulnerable to the effects of climate change through increases in sea levels, precipitation events, summer heat waves, and the frequency and intensity of storms. CEI is a signatory of the We Are Still In Agreement, and through the Community Ecology Center we seek to educate and support individuals, families, organizations, and communities on the local effects of climate change and empower them to harness local opportunities for action through Mitigation, Adaptation and Resilience. The Community Ecology Center will provide opportunities for people and organizations to calculate their “Carbon Footprint” (the amount of GHG they emit) and provide corresponding actions that can strategically reduce those footprints. Workshops and information sessions will be the platform for discussing the methods of calculations, recommendations for reductions such as carbon sequestration gardens, energy efficiency options and habits that can reduce carbon output. 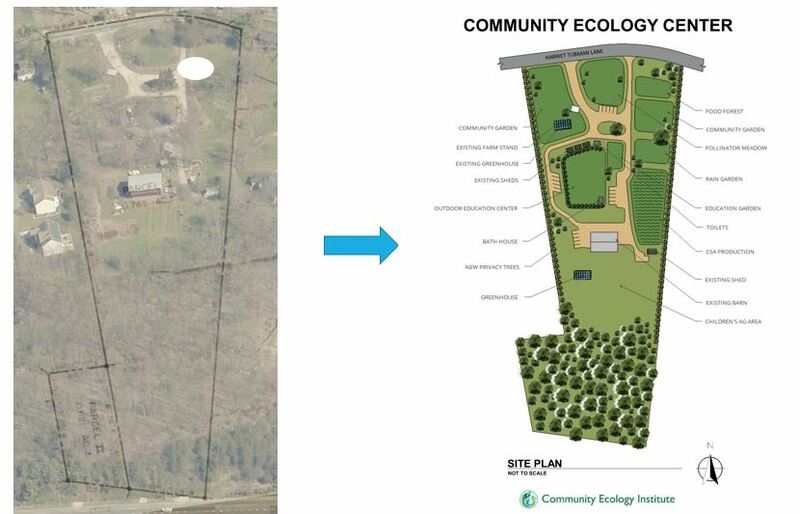 The Community Ecology Center will assist residents and their communities in building resiliency in conjunction with mitigation and adaptation efforts through a series of educational workshops with topics such as emergency preparedness, urban forestry, water conservation, sustainability, supporting local farms, gardening, and how to engage with local and state political initiatives and planning. Howard County Executive Calvin Ball today made a series of environmental commitments that will make the County a leader in environmental sustainability, reduce emissions and stem the causes of climate change. 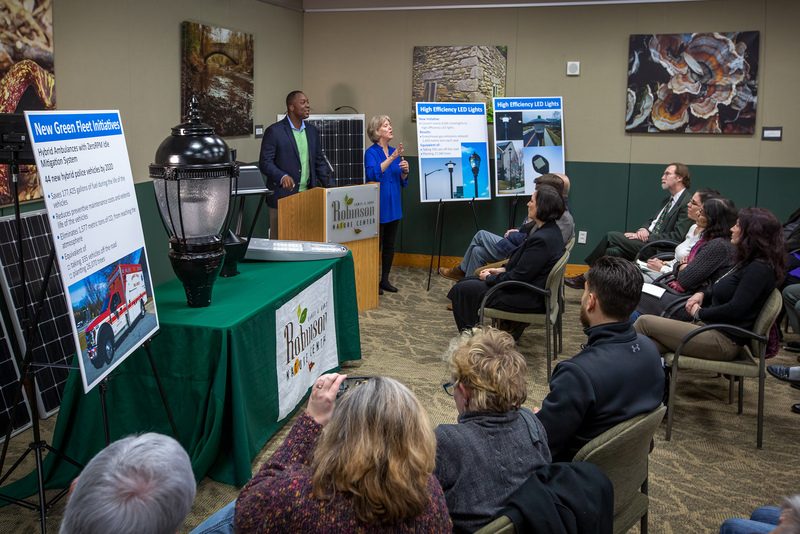 The news conference was held at the County’s Robinson Nature Center, a LEED Platinum facility operated by Howard County Recreation and Parks. “It will be on all of us to continue to lead by example in the fight against climate change,” said Ball. “As your County Executive, I pledge bold leadership to make Howard County a safe and healthy place for generations to come. Additionally, Ball committed to reduce land waste by announcing the expansion of the curbside food scraps collections area that will include almost 10,000 additional homes to the program. These residents will receive a postcard with signup information about the service which is set to begin on April 1st. The expanded area being served will include parts of the Villages of Owen Brown and Oakland Mills.